Argentina has waited a long time for its "welcome back" party to the world stage. The country is hosting its first major global event this week after 12 years of populist rule crippled the economy. The World Economic Forum's Latin America summit started its first full day in Buenos Aires on Thursday. It's the first of a slew of high stakes international events coming to Argentina's capital. "Argentina is back in the world. Argentina wants to play a role in the global scenario," President Mauricio Macri told CNN in an interview Thursday. "Argentina is in the middle of a cultural change." Macri scored a victory in March, when Argentina -- South America's second largest economy -- officially ended its year-long recession. The world is paying attention. Next year, Argentina will hold the G20 summit, which Germany is hosting this year. And before that, in December, the World Trade Organization hosts a summit. Other international organizations too have forums lined up in Buenos Aires, long known as the "Paris of South America." 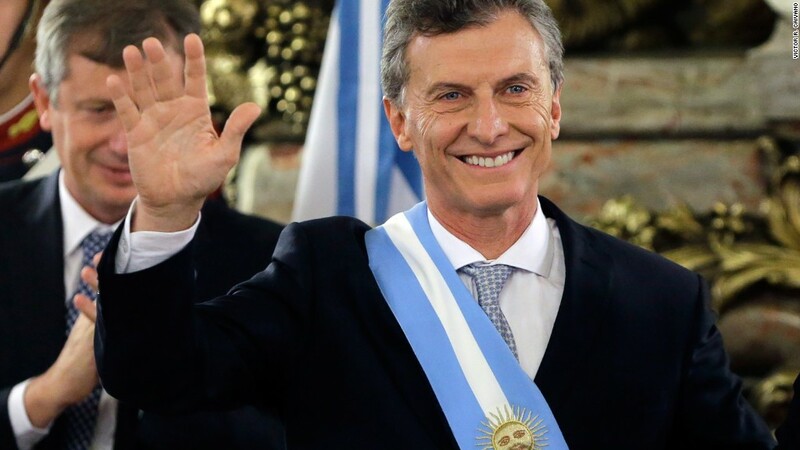 Macri, who took office in December 2015, has reversed the country's economic policies to open it up to global trade after the last president, Cristina Fernandez de Kirchner, shuttered much of the economy with tariffs and protectionist policies. Macri ended export tariffs, cut income taxes, allowed the currency to float freely, resolved a decade-long dispute with bondholders and brought in foreign investment. Still, turning the ship around takes time, which isn't on Macri's side. Argentina has mid-term elections coming up in October, and Macri's party needs to win several more seats in Congress to push through reforms to overturn populist policies. The election's outcome holds the key to the country's economic performance, experts say. Although the recession ended on paper, Argentina -- which has a long history of economic woes -- hasn't fully dug out of its hole. "It's showing signs of recovery with some questions marks," says Daniel Artana, chief economist at the Latin American Economic Research Foundation. "We think that we will overcome those questions marks." Topping that list is inflation, which rose 40% last year, as Macri's administration freed up currency controls and removed some subsidies on electricity and other items put in place by the Kirchner regime. High inflation caused food, housing and transit prices to rise. Macri's policies may be churning out results: inflation is expected to rise 20% this year -- still very high for any country, but better than where it was. However, many Argentines are bitter over skyrocketing electricity prices -- up between 300% and 500% -- after years of mostly fixed prices. Powerful labor unions are also trying to ruin Macri's big moment this week as host: Bus and subway workers in Buenos Aires went on strike Thursday, shutting down public transit. For weeks, thousands of teachers have gone on strike as they negotiate higher salaries with the provincial government, which supports Macri. And there's trade. Macri is trying to bring more free trade to Argentina, one of the most closed economies in the world. "We have to go through a journey of gradual, intelligent openness to the world," Macri told CNN. Last week his government ended a 35% tariff, or tax, on computers and tablets put in place by Kirchner. It made Argentina one of the most expensive places in the world to buy iPhones and iPads. On Friday, stores are expected to legally sell iPhones for the first time since 2011. Economists say removing more tariffs over time could help boost much-needed economic growth. But some Argentines fear that as Macri opens up the country to free trade, he will put manufacturing jobs at risk -- a concern he says he's keenly aware of. Still, former officials who recall the populist days which led to a closed country, say Argentina is moving in the right direction. "The goal of this government is to make Argentina a normal country," says Martin Redrado, former president of Argentina's central bank and founder of Fundacion Capital, a nonprofit institute. "I am optimistic about Argentina long term."